My 1996 Western Illinois Vacation. 3 days, 700 miles. We decided to go out and follow Ol' Man River, for no particular reason. Purely by accident, we ran across Nauvoo, IL, my first real encounter with the Mormons. I was pretty ignorant of their history in 1996, and if I were to go back today, I'd be more interested in the historical aspects of the city. The Mormons have a very interesting history, persecuted and made scapegoats due to the religious intolerance at the time. When they were run out of the US in the mid-1850's, they pioneered to what is now Utah, outside of the reaches of the United States. 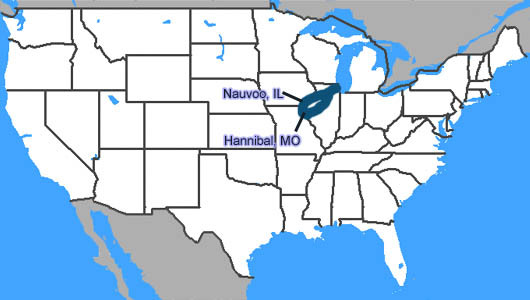 Home to one of the greatest humorists of our time, Hannibal, Missouri was eventually our final destination. It'd been years since I read Tom Sawyer, but here we were, looking at the buildings and landmarks that were used to make Sam Clemens's characters come alive.